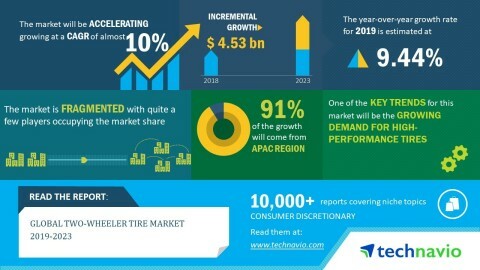 LONDON--(BUSINESS WIRE)--Technavio has announced the release of their research report on the global two-wheeler tire market for the forecast period 2019-2023. This global two-wheeler tire market analysis report segments the market by application (motorcycles and scooters) and geography (APAC, Europe, the Middle East, and Africa, North America, and South America). Global two-wheeler tire market size will grow by USD 4.53 billion during 2019-2023, at a CAGR of nearly 10%. The increase in disposable income of consumers in emerging economies has increased the demand for high-performance motorcycles. These motorcycles come equipped with high-performance tires that offer superior grip and performance. Also, the increased adoption of high-performance electric motorcycles has encouraged many tire manufacturers to offer products that enhance the mile range. For instance, Zero Motorcycles uses the highly popular Pirelli Diablo Rosso III tires for its models. The trend of adopting high-performance tires across the product portfolio of many two-wheeler manufacturers will fuel the growth of the market. The increase in the sales of two-wheelers across the world is directly influencing the growth of the two-wheeler market. Tires are among the most commonly replaced components in a two-wheeler. The replacement tires market is witnessing rapid growth because of the high-volume in emerging economies such as China, India, Vietnam, Indonesia, and others. With the rise in the population of motorcycles, the demand for two-wheeler tires is increasing considerably. This factor is expected to drive the growth of the global two-wheeler tire market during the forecast period. “The APAC region dominates the two-wheeler tires market because of a large number of motorcycle sales from countries such as India, China, and Indonesia. These countries have high adoption rates of cost-effective scooters and motorcycles. Europe will grow faster than the overall market during the forecast period. Many European countries are witnessing the rise in adoption of high-performance electric motorcycles because of stringent emission regulations. These aspects will boost the growth of the global two-wheeler tire market during 2019-2023”, says an analyst at Technavio. Apollo Tyres entered the Indian market by offering a range of two-wheeler tires. The company also offers high-performance tires and tires for heavyweight motorcycles. Furthermore, the company is developing steel radial tires for top-end motorcycles. Various tire manufacturers are expanding their business by adopting inorganic growth strategies. For instance, Michelin acquired Levorin, a Brazilian tire manufacturer to strengthen its position in offering tires for commuter motorcycles in the South American region. Many such plans among vendors will positively impact the market’s growth. Technavio has announced the release of their research report on the global two-wheeler tire market for the forecast period 2019-2023.